This week’s Blog comes from APA coach Fabrizio Garguilo all about warming-up and cooling down. It has been well established in the sports and fitness industry that a warm up should precede strenuous physical exercise, typically a light jog to stimulate some blood flood and some stretches to ‘loosen up’. However more recently advances in physical preparation for strenuous exercise have been made to include; injury prevention, muscle activation, joint mobilisation and stabilisation exercises, as well as a shift in focus towards sport specific movements in competitive athletes. These great improvements will be discussed further in this blog along with methods and rationale for appropriate ‘cooling down’ exercises, which appear to still be a neglected area of strength and conditioning but could actually act as a fantastic preventative, educational and recovery enhancing time if used correctly. Warm ups have been around for several decades, originally a light jog on lap of the field followed by some static stretches was prescribed by coaches from the school PE teacher level to international athletes. However thankfully nowadays we have sports science to help guide coaches towards far more appropriate warm ups. The aim of a warm up is to prepare the body for competition, strenuous activity or in ancient times combat. Modern research has led to the development of protocols such as the RAMP method. This warm up consists of Raising the pulse, Activating the muscles, Mobilising the joints and Potentiating movement all in preparation for competition. Examples of exercises that can be used to raise the pulse are; skipping – at APA we have devised a challenge that encompasses as many skips as possible in a minute, followed by the challenge of completing half the number of skips you got in a minute in a 30 second blast, with target scores of 200 and 100 respectively. Classically running can be used, however I prefer to encourage other exercises such as ice-skaters, side shuffles, low-knee skips and hop-scotch into the early part of the warm up. Activation exercises such as band rows and external rotation of the shoulder are good examples of upper body exercises and glute bridges, band walks and lunges are good lower body activators – main muscle group targeted is typically the glutes. Mobilisation can take the form of exercises designed to increase the athletes’ range at a joint, such as deep squats, overhead squats, single leg squats, spiderman or caterpillar crawls. Finally potentiating movements should mimic the movements that will constitute the performance of the sport. For example pass and move in football, racket swings in tennis, lay up shots in basketball, all can be made into small drills building in intensity towards the start of the match or training session. This is an example of a joint mobilisation warm up, all the stretches are dynamic and there is a flow between exercises to increase blood flow and mobility of the connective fascia. Simple muscle stretching can also be beneficial depending on the sport and need of each athlete. There are also various other forms of stretching such as foam rolling, assisted stretching using a partner or apparatus as shown here can also be beneficial. Although typically static stretching is reserved for post-exercise, if the athlete needs to increase their range of motion because they are particularly stiff or tight, it can be used as part of a warming up process. The aim of the cool down process – the other end of your bookends on your workout – is to restore the body back to its pre-exercise state and to assist in recovery from strenuous exercise. There are many methods that can be used, typically static stretching is most commonplace, however the recent additions to many gyms of foam rollers, bands and balls that can be used for post-exercise cool downs has improved the general perception of finishing off a workout with a 5-10 minute period of focussed exercise. Alongside stretching, rolling and bringing body temperature and heart rate back to normal resting levels, athletes can maximise the efficiency of their recovery by showering – to remove waste products excreted as sweat from the skin, maximising the ‘open window’ of replacing nutrients within 2 hours post-exercise and ensuring this fulfils the needs of the body – a recovery meal should be high in carbohydrate, protein and vitamins and minerals, but also low in fat to replenish used stores within the body. Another important factor that most amateur athletes will struggle to accomplish because they live working lives is to physically rest between training or competing. To lay down with flat or elevated feet and even to mentally relax can help with the feeling of being recovered. This is particularly poignant in travelling athletes, where added stress of travel in confined spaces can increase stress on the body. If you are presented with an opportunity to rest, that is exactly what you should do. Kit every athlete should carry in their bag to help – tennis ball, golf ball, hockey ball, foam roller – all for self Myofascial massage. Water bottle – to keep hydrated, supplements – protein, meal replacement, vitamins if on long distance travel. Resistance bands, can be used for stretching and activation exercises. In summary, tagging 10 minutes onto each end of your workout can have a significant effect on your health, flexibility, injury prevention, state of readiness and ultimately performance. It is something well worth doing and why most athletes’ gym sessions last closer to 90 minutes than 60. To follow up the last post I thought I would give some key take home messages from the second presentation at the Lawn Tennis Association HPC S&C Workshop. As part of my role as Head of S&C at Gosling Tennis Academy I get to go down to the National Tennis Centre (NTC) three times a year to discuss a range of topics relevant to S&C practitioners working in Tennis. This next presentation was by Richard Blagrove (Programme Director, St Mary’s University) all about enhancing Tennis Performance with Running drills. Before I get to the presentation I just want to touch on the reading I have been doing on the former Soviet block work in the area of Plyometrics. If you have read part 1 and part 2 of my Blog posts on Periodisation for Tennis you will know I’ve got right back into my reading on the old Soviet Block Periodisation concepts from the 1960s-1980s. 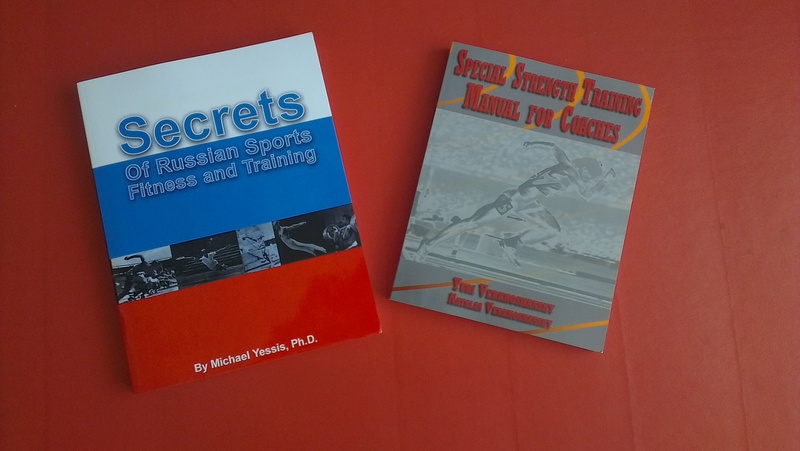 While there are many people who have criticised aspects of Russian training models (myself included) I strongly encourage you to have a look at ‘Special Strength Training for Sports’ by Yuri and Natalia Verkhoshansky. I now have a new appreciation of how incredible they are as applied sport scientists and an even greater appreciation of how far ahead of its time the USSR sports programme was. The whole concept of plyometrics evolved from Yuri’s work with his athletes because he was looking for a way to overload his high jumpers. He knew from his research that a high jumper could experience up to 300kg in impact loading forces at the point of take off on the single leg. He was searching for ways to prepare his athletes for this and experimented with heavy explosive jump squats. But due to the long lanky frames of the high jumpers this caused back pain. Now one winter he was forced to train his athletes in a small space in a corridor as there was no gym and he couldn’t go outside so he decided to get his athletes to lift barbell weights and jump off some boxes during the winter months. Through experiments he found that the ‘shock’ of jumping off a high box had an amazing effect on the explosive power of his athletes and the term ‘shock method,’ was born. The term pliometric was the original term used in Russian literature to describe the yielding or eccentric phase of the stretch-shortening cycle. An American coach later took this term and came up with ‘plyometrics’ and the rest is history!! Get the book; it will blow your mind!! Richard is clearly a very smart guy. He set the scene really nicely and took us through his training philosophy which basically highlighted the need for a thorough analysis of the sport, using appropriate tests to determine basic fitness level, strength characteristics and movement quality, and having an understanding of the adaptation process. Only by understanding how the body then adapts to different types of stressors can you begin to choose appropriate methods to overload the right type of neuro-muscular qualities. Then he put up a nice slide on biomotor abilities and their inter-relatedness. I wrote about Reactive Strength in part 2 of my Blog post on Periodisation for Tennis and I will be covering more in Part 3 which is coming up in a few weeks. Richard talks here also about muscular contractions as being on a continuum with Eccentric contractions (Eccentric control) to the Left side and Concentric contractions to the Right side (Extensor Explosive strength). 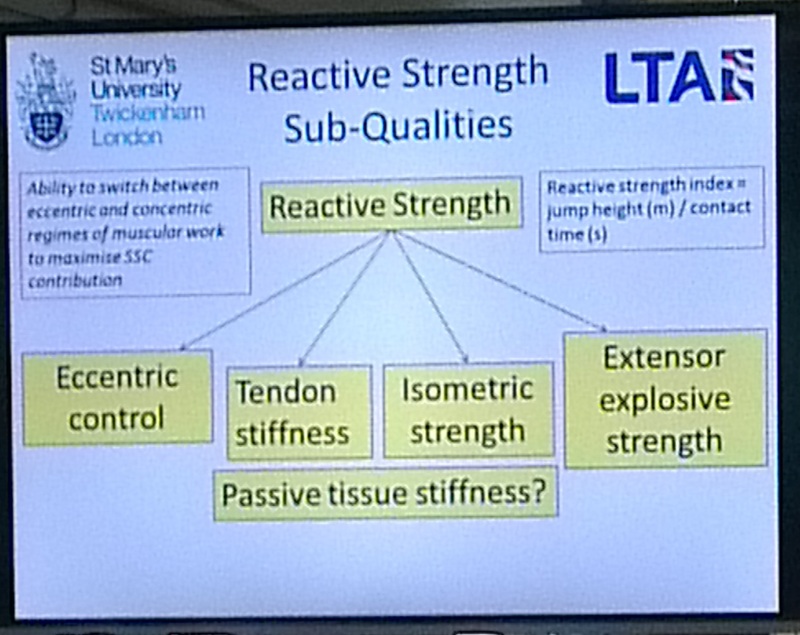 In the middle are the Isometric strength qualities. All of these contractions need to be utilised when performing exercises which make use of the stretch-shortening cycle (SSC), but in different amounts, depending on the type of exercise. The eccentric component on the Left side is related to the quality of ‘Muscle/Tendon Stiffness‘ and the concentric component on the right side is related to the quality of Muscle Compliance. You could make an argument for saying that runners/sprinters need a higher level of Stiffness and less compliance whereas the opposite could be said for Tennis. This is because in Tennis there is a wider amplitude of movements required. Runners just need to keep their hips extended and run on the balls of the feet. Tennis players will go in and out of triple flexion/extension. What constitutes a ‘True’ Plyometric exercise? The gold standard is 3.0 on the Reactive Strength Index (RSI) which could typically be achieved by jumping 60cm in the air with a ground contact of 0.2 seconds. A plyometric jump with a ground contact under 0.2 seconds is also known as a ‘Fast SSC jump.’ A plyometric jump with a ground contact over 0.2 seconds is known as a ‘Slow SSC jump‘ or a ballistic jump. You may decide to test the Counter movement jump and squat jump as we invariably do for the Lawn Tennis Association (LTA) test battery but also consider where the fast SSC jumps may fit into testing, monitoring and training. Richard qualified that while these movements were not Tennis specific they developed important athletic qualities that could help support an overall athletic development programme for a sport that is based on running. Below are a few short videos of the S&C coaches doing some of the drills. There were a lot of the typical hurdle and A march/Askip/B march/B skip drills that we all do with our athletes but I thought I would include some of the less often used ones that I saw. Sorry for the mobile phone video quality but it should give you an idea! As you will all know APA does a large amount of our work in Tennis. As part of our contract with Gosling Tennis Academy and my own personal role as Head of S&C for the International High Performance Centre (IHPC) there I get the opportunity to go down to the National Tennis Centre 3 times a year to listen to various people speak about topics relevant to our role as S&C coaches in Tennis. So I thought I would give a ‘cliff notes’ Blog review of the four presentations and take home messages. Many of the topics were personally areas that I am currently researching in great detail at the moment so it was great to test many of my ideas against what others are doing with the same information. This Blog will kick off with a review on Heart rate monitoring. At Gosling we are lucky to be able to use the same wireless telemetry system as at the NTC, namely the Firstbeat system which is also used by the Rugby Football Union. The main benefit is that it uses Heart Rate Variability (HRV) data (e.g., the time between individual heart beats) to measure the response rather than a fixed sampling rate like some other software providers. Right Firstbeat- that’s your plug so I’ll expect our free upgrade next week!! Tennis is just starting to use heart rate monitoring more widely now. It will be a little while before its use becomes widespread like it is in Rugby and Football but it is getting more and more popular. The key benefit to coaches is that it gives objective training data to help support whether the training load planned was actually what took place. One of the things Emma said that was really insightful was that often players of similar tennis ability may have completely different responses to the same tennis session. Whereas one player may get under-trained from a session, for another player that could represent a very hard session. This means we shouldn’t assume that a session will affect everyone equally. When I first started using Firstbeat (and to an extent I haven’t changed) I would mainly monitor Heart rate and something called Training Effect, which is a number from 1 to 5 to measure the overall ‘cardiac stress’ on the heart. However, Emma talked a lot today about Excess Post Oxygen Consumption (EPOC), as a good variable to look at to determine overall ‘Aerobic Load.’ This will give a good overall gauge of accumulation of lactate / fatigue as effected by the work-rest ratio and intensity of effort. Typically the highest aerobic loads will be experienced by Tennis players during the ‘warm-up’ aspect of the Tennis session (ie., the first 20-30 minutes of rallying/consistency drills done where there is little interruption by the coaches or stoppages between shots). This is often where the players will feel the most stress on the heart. EPOC values for say a 10K run would typically fall around 200 and the curve would steadily rise throughout the race. In Tennis you will get a big fast rise in the curve during the warm-up to maybe 200 then there will usually be lots of peaks and troughs throughout the session. Below is a chart that Emma gives to the Tennis coaches to help them make sense of all the data. The data on ‘Matchplay’ in the Top Right was taken from training matches used to pick players for the Davis Cup so these were really competitively fought matches. The data on the bottom left was used to demonstrate how a training session that has a low aerobic load (bottom figure) has NOT been successful in replicating the physiological demands of the game represented by the top figure. So if you are planning a session that is supposed to replicate a match it needs to have an EPOC peak of 84-130 (aim for 100 as an average guide). I guess I’ve covered some of these points already but the key thing for me is that Tennis has a culture that we are fighting against as S&C practitioners which is one of high intensity training with little to no planned variation in loading. If it is varied it is not often planned. We also have a culture of training for consistency/volume in the morning then applying these skills in matches in the afternoon. There is also a culture of playing more practice matches later in the week. These concepts makes intuitive sense as you want to ‘learn/train’ in the morning then ‘apply‘ in the afternoon. Players also like to do more match play type training later in the week as they are getting ready to compete at the weekend. However, remember this means you are always practising playing your matches under fatigue. This is useful as players will have to learn to play in the later stages of a tournament under fatigue. But also remember that matches tend to be more competitive than training and have higher ‘mechanical loads’ from more sprints and changes of direction. These need to be practised while FRESH if you want to get the highest effort levels out of the players. 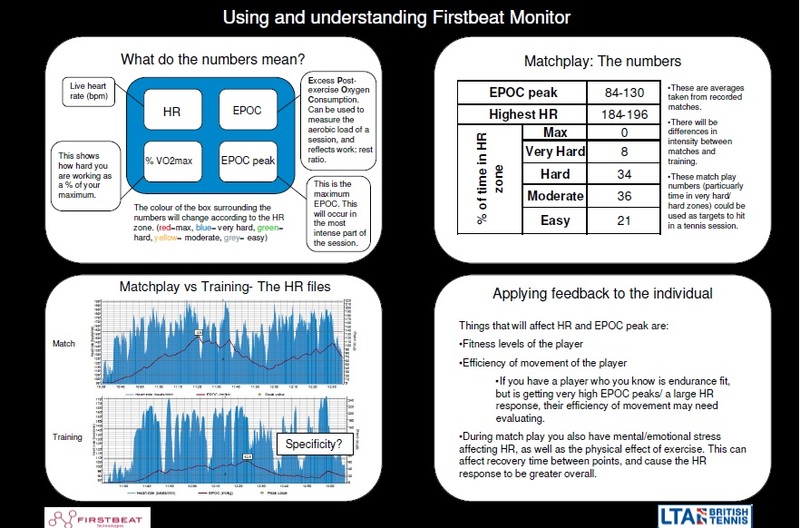 The heart rate monitoring can help to EDUCATE players and coaches (both Tennis and S&C coaches) about the actual training load of the session. 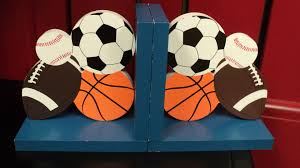 Do you want your player to be getting more and more tired through the week? And did you even know that it was happening? Below is an example of a week of monitoring for a coach who was known for wanting their players to work HARD twice a day for 2 hours each session, every day. 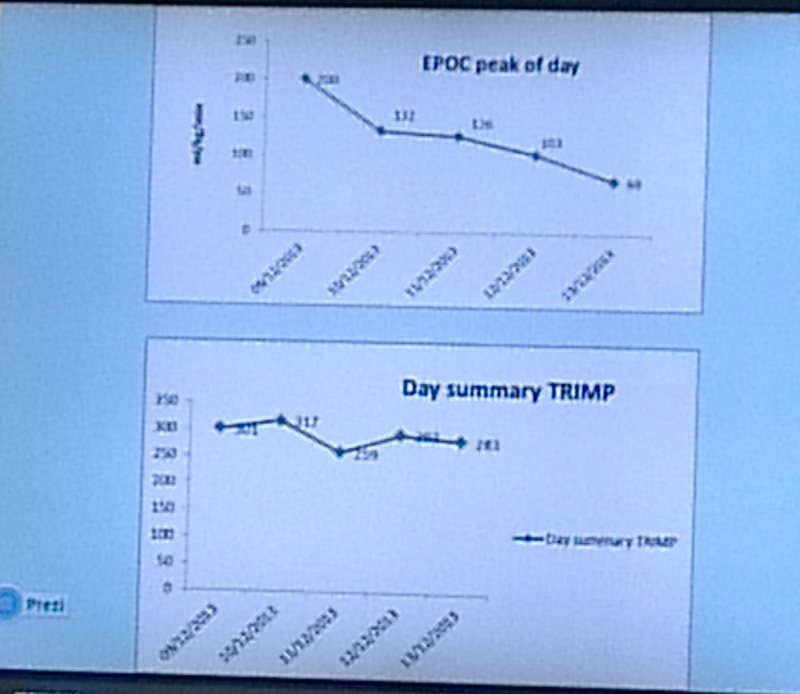 It was felt this was getting the player too tired so Emma took the EPOCpeak for the day across 5 days and showed that it fell significantly throughout the week starting at 200 and finishing at 69. The moral of the story was that if the player had had an easier day on Tuesday after the 200 load they probably could have got another 200 out again later in the week. This is on the basis that Tennis load is usually moderate overall. While it is often ‘safe to assume’ that the overall Tennis load is medium in terms of aerobic load, the data above clearly highlight that unless we’re assessing we are guessing, and we might be getting it wrong. Too many weeks like that for that athlete and we are looking at burnout. Imagine if we were putting very high intensity intervals on top of that!! Finally, to wrap it up Emma made a good point about Tennis Specificity. Players will often get adequate load from playing tennis (although see above comment to qualify that point), so they don’t really need extra off court conditioning. However, if your monitoring indicates that a player is NOT coping well with the training load and would need a bit of a boost then you are probably best to keep them on the court. Often these athletes are either bigger framed men and/or in some cases carrying a bit of extra fat mass. If they are really out of shape you can get them off their feet and start with some bike intervals but ultimately that won’t address their movement efficiency on the court as they won’t need to support their weight on the bike. So try and get them on the court and either integrate some conditioned tennis drills (such as Spanish drills and other basket drills) into the end of the session and also do some movement shadowing with medicine balls etc. If like many of us have already experienced, the coaches and players are reluctant to do a Yo yo test to monitor the aerobic load of these players on a regular basis to see if they are getting fitter then something that can work well is doing a incremental treadmill test over 10 minutes starting at 6km/h (female) and 9km/h (male) at 1% gradient and increasing the speed every 1 minute by 1km/h until exhaustion. Expect them to make 10 minutes. If they can’t do that then however you slice it, they are not fit at a general level and would probably be wise to keep prioritising aerobic training until it improves! I hope you enjoyed the first instalment. 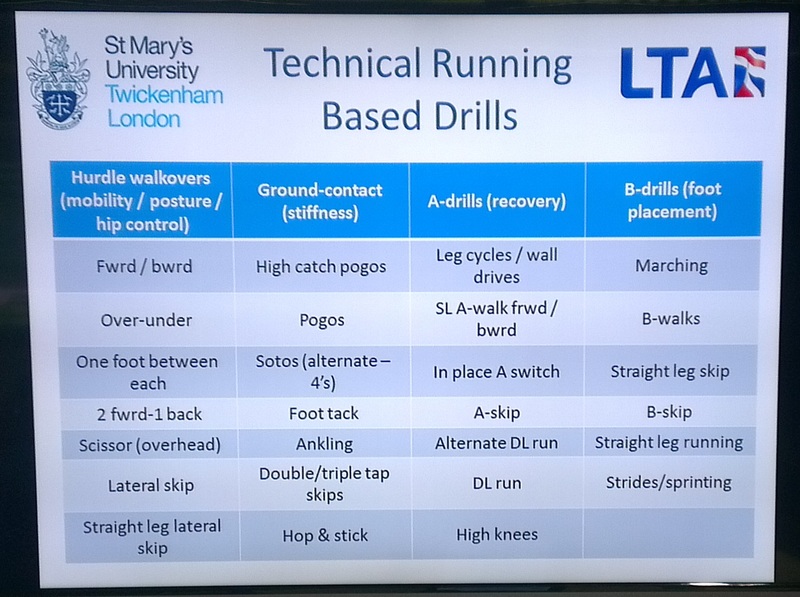 I’ll be talking about ‘reactive strength,’ stiffness and running drills in the next one. This post is a follow up to my previous post on Periodisation- Part 1 which you can see here. In this post I would like to share with you some of my recent thoughts on the topic of Transfer of Training. The holy grail of strength & conditioning in my view, is taking an athlete and training them so that the physical gains they make actually enhance their sports performance- this would be a successful transfer of training. I originally came across some of the work of the old Soviet regime from looking at a great website all about the Canadian Athletics Coaching Centre which you can see here. It was here that I first had the chance to read articles written by authorities like Verkhoshansky and Matveyev. But I kept hearing about a coach called Dr. Anatoly Bondarchuk who was working with hammer throwers at the time and was applying his concepts of ‘Transfer of Training’ to his training methodology. I bought a book of his work in around 2009 but at that time it was not well translated from his native language and I felt I had an incomplete understanding of his concepts. This also coincided with a chance discussion with Dr Mike Stone at the UKSCA Conference around the same time. He was a little critical of the statistics which Bondarchuk had used to determine the correlation between all kinds of different exercises and their effect on specific performances in an event. (Or at least that is what I took away from our brief discussion- as I don’t want to misquote Mike Stone!). Therefore I never really followed through in this area of my learning and for better or worse kept going with my training system as I understood it at that time. So fast forward to the present day, April 2014 and I now stumble across the website of Central Virginia Sports Performance (click here) and his name amongst others comes up again, as well as Natalia Verkhoshansky who is continuing the great work of her father, Yuri. Now 5 years later their work is becoming more accessible thanks to the power of the web and better translations, so I figure it’s time to take another look. For this post I just wanted to run down on my application of the concept of Transfer of Training and how it fits into the APA Training System. ”The final goal of competition exercises in Olympic sports („Citius, Altius, Fortius‟ – „Faster, Higher, Stronger‟) may almost always be related to the capacity to express power produced by the speed of movements and by the force of overcoming external resistance. Every sports skill without exception can be thought of as a complex motor action which is created in order to solve a particular movement task specific to that sport. This motor action is often called the motor pattern (as it is usually the combination of separate motor actions) and sports coaches often refer to it as a ‘movement pattern’ when referring to the physical aspects of the motor skill. As it relates to the work of the Soviet researchers this motor pattern is called the ‘Competition Exercise’ or (CE). Kinetics – is one of the branches of dynamics, concerned with what body movements are produced under the action of particular forces. Not to be confused with kinematics, the study of motion without regard to force or mass. – force stored in the muscle-complex as elastic energy during the preparatory phases of movements. Therefore, increasing the power output of competition exercise regards increasing the body’s capacity to generate enough active force to overcome the external and internal opposition which will enable the acquisition of specific skill to control the body movements. Now I am definitely not going to get into the ‘How Strong is Strong Enough?’ debate in this blog. At this point I merely want to draw attention to the fact that we should be starting to work back from knowing what the competition exercise is that we want our athlete to be really good at and also understanding the types of forces needed to excel in it!!! ”To obtain a necessary kinematic characteristics of the complex motor action, the motor control system operates not at the level of single muscle, but at the level of innate functional components of the human motor apparatus, called working mechanisms, involving them in appropriate ratio to solve a given motor task.” Verkhoshansky, N (2011). 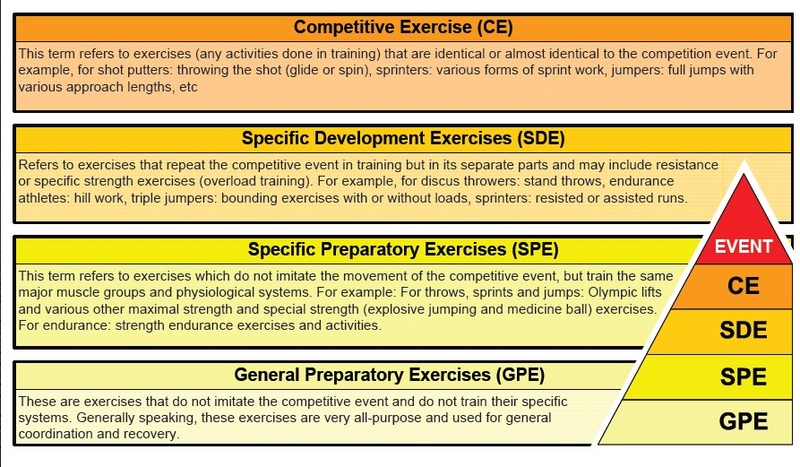 It’s now that we can start to discuss the terms ‘General’ and ‘Specific’ as they relate to the types of exercises we might want to use in the ‘Preparation’ phase. I deliberately didn’t want to talk about exercise categorisation in the last blog as this is a massive topic in itself. The best way I can describe the way I approach my training preparation phase is I start with a greater focus on general training means early in the preparation phase and increasingly focus on more specific training means as we progress through the preparation phase. Track & Field coaches use the classification adopted from the Soviet researchers. We can now start to think in these terms, starting with the end in mind and working back to choose the exercises that we need to start with. Using this concept most sports will have similar training means at the general level of exercise classification and they will diverge as the methods become increasingly specific. Typically the more General the exercise in nature the more ‘global’ the muscles that are recruited such as the large muscles of the quadriceps, hamstrings and glutes in the barbell back squat. 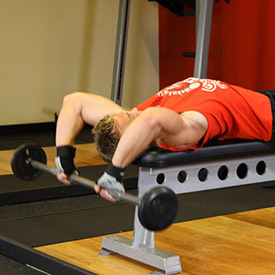 The more specific the more ‘local’ the muscles that are recruited such as the upper fibres of the latissimus dorsi during explosive shoulder extension as would be performed in a weighted barbell pullover. I remember Calvin Morris saying he used to do this exercise with Steve Backley as part of his specific exercise regime for the javelin throw. Key point: Not all athletes will do Advanced exercises in their General Preparation. If you would like to look at the terminology described above I would definitely check out the Canadian athletics Coaching Centre website and also have a look at a great website called ‘Complimentary Training’ by Mladen Jovanovic and a blog which goes into detail on these topics. Click here for a link to one of his blogs on this topic. Now that we have set the scene for the importance of the competitive exercise we need to go back to the science. The different conditions under which the neuro-muscular system works during the execution of different competition exercises recall different mechanisms for assuring these changes. For example the main competition exercises for a jumper, a thrower, a sprinter, a middle distance runner, an MMA athlete, a tennis player and a soccer player all place different demands on the body. These mechanisms are related to the activation of different functional characteristics (options) of the neuro-muscular system (motor unit recruitment, motor unit activation frequency, motor unit synchronisation and others), which are usually associated with different strength capabilities. Explosive Strength (J) – is characterized by the athlete‟s capability to achieve maximal force-effort (FMAX) in the shortest time (TMAX): J = FMAX/TMAX. Starting Strength (Q) – is characterized by the athlete‟s capability to produce rapid increases in force-effort at the start of muscular tension. It is measured by the so called Starting Strength gradient: S-gradient = F0,5 MAX / T0,5 MAX). Accelerating Strength (G) – is characterized by the athlete‟s capability to rapidly achieve the maximal value of force effort (FMAX) in the final phase of muscular tension. Usually, it is measured by the so called Acceleration Strength gradient: A-gradient = F0,5 MAX / (TMAX – T0,5 MAX). Verkhoshansky explains that ”In movements executed with different levels of external opposition the basic strength capabilities do not have equal relevance in obtaining the highest power output of the competitive exercise. For example, when the force-effort is displayed in high speed movements with a small external resistance, its magnitude is determined by the so-called High-Speed Strength (Fv), strictly correlated with Starting Strength (Q). As resistance increases, Explosive and, after, Accelerating Strength become more important. Basic strength capabilities expressed in different regimes of muscular contraction usually require activation of different functional options of the neuro-muscular system. For example, the capacities to generate maximal force in isometric and dynamic regimes of muscular contraction are assured by different neuro-muscular mechanisms, which are relatively independent of each other in their functional display and development. However, an important consideration to keep in mind is that sports movements are usually executed in a mixed regime of muscular contraction. For example, during a single explosive movement in which the athlete has to displace a heavy load from a standing position, before initiating the movement, the muscles work in an isometric regime (e.g. shot putt). As soon as the developing isometric force-effort achieves the level of the opposite resistance force, the movement starts and the muscles begin to work in the dynamic regime. In the so-called ”starting movements” executed without a ”countermovement” against heavy resistance (for example overcoming the body’s static inertia), the major role is played by Maximal Strength (Po) and Explosive Strength (J), expressed in an isometric regime (e.g., Power lifting and Olympic weightlifting). When the explosive movement is executed with a ”countermovement”, i.e., in the reversal yielding-overcoming (“eccentric-concentric”) regime, the major role is played by Explosive Strength (J) expressed in the overcoming (“concentric”) regime. Therefore, to reiterate the original point, different training means, used together in the training process can elicit an integrated functional adaptation (Cumulative Training Effect), using a pre-determined combination of different means. How does this apply to Tennis? Clearly Tennis places a wide variety of demands on the body. At first glance you might think that because the Tennis player is working against a relatively insignificant external resistance (tennis ball) that there is no need to do ANY explosive weightlifting exercises at the higher end of the Force-Velocity spectrum (Olympic lifts at >70% 1RM); they should just lift everything light and fast. But one of the things I learnt from reading Verkoshansky’s work is that ‘impact’ forces are extremely high and some of the explosive movements in Tennis, especially when returning wide serves and flat out running out wide do place significant load on the body which we must prepare for. It’s not just as simple as saying that because they only have to overcome their own body mass and that of a tennis ball that they don’t need to work against any significant loads! High Speed-Strength: during the majority of high power tennis shots when hitting the ball! My summary of this blog is that you need to know your sport. You need to know what the competition exercise or exercises are and you then need to plan appropriate training methods that will enhance the physical mechanisms that will overload and subsequently improve performance in these skills. In the final Blog post on periodisation coming next I will attempt to analyse the competitive exercises needed for Tennis and the most appropriate training methods for these. In the mean time I highly recommend you check out the two books below. 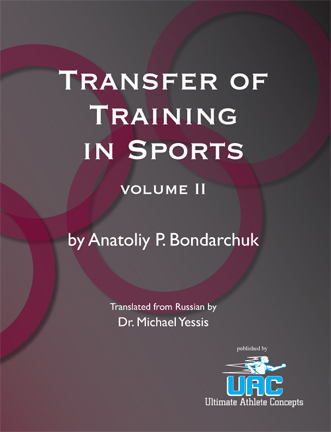 The ‘Secrets of Russian Sports Fitness and Training’ is an easy read and you can blast through it in a day. The Special Strength Training Manual,’ is equally compelling but it a bit more in depth and would definitely need a bit of background understanding of training theory. Remember to visit us online HERE for more updates on our latest workshops and qualifications. This week’s guest blog comes from APA coach Fabrizio Gargiulo. As the Easter weekend is upon us many of APA’s athletes will be on the road competing so this post will cover some of Fab’s thoughts on the role of the S&C coach during this time. This is an example of managing a group or individual player through a season of competitive matches, travelling all across a country and competing in various competitions, some of which will have greater importance and this again is a factor for the S&C coach to consider when planning training for the players to bring them to optimal state of readiness. Sometimes it may be of greater value to the long term goals if an athlete is not at optimal readiness because they are training to achieve a peak in performance later down the line. More recently I have worked with a professional tennis player during a tournament block lasting 3 weeks. This presents a different situation to the S&C coach. Being abroad you are in unfamiliar circumstances, you may have a language barrier; you may or may not have access to a gym, equipment or space. In tennis, players typically play daily (if they continue winning) throughout a tournament, with the occasional day off due to scheduling. Ultimately your role as an S&C coach doesn’t change – optimal preparation and recovery – however when you are in a tournament block you need to work backwards from your competitive start date and this means that you can do some training (maintenance) to keep fitness and strength levels up when they are not competing. For example player A starts playing matches on Saturday, he arrives in the country Thursday lunchtime, this gives you approximately 36 hours where you can do some work, the initial goals will be to get the player ready, this may involve a recovery run, a light weights sessions, massage, flexibility or a more intense low volume session to get up to match speed quickly. Player A then wins his match so plays Sunday, S&C coach must help him recover and be ready for Sunday. Player A continues to win until Tuesday, he now has 3 days until his next tournament starts again, the S&C coach must make a call on whether the player should have a rest day, recovery day or training day. Likely also that player A continues winning his matches and ends up in the final on Friday, win or lose he will play again the following day in the next tournament, during that week the player will not train and only focus on recovery, the intensity of match play will be enough to maintain fitness for a while, however over a prolonged period fitness and strength in particular will begin to diminish, thus at some point the S&C coach may have to place the player back into some training and out of the competition block. Typically in tennis players are able to compete in 2-6 week’s worth of tournaments before returning to a 1-3 week training block. A major part of being an S&C coach is the ability to think on the job and to have multiple plans to use dependent upon the situation. There are some great pieces of portable equipment available to use to help out with this, things like; TRX, resistance bands, water filled balls and good old fashioned knowledge of body weight training and utilising what you have in your surroundings – squats with your suitcase, step ups on hotel chairs, pull ups on a tree or climbing frame, stair runs etc can all be integrated into keeping your player fresh and focussed and is often a good change up to the usual training they do in the gym on the track, pitch or court. Finally from an athletes’ perspective I have been a competitor at several important matches and tournaments all across Europe. From travelling 24 hours on a bus for a single match or getting a 6am flight to play an afternoon kick off and then fly home all in the same day to taking part in 10-12 day tournaments with 3 international matches in 6 days, as an athlete you often don’t know what to expect or how it is going to feel until you have experienced it. Single matches present different challenges to tournaments, your physical state is important but if it is not at a true peak, I often found that the mental focus was more important than getting 8 hours sleep the night before, of course if you are smart you will make sure you are rested up before taking the trip, but sometimes it is unavoidable when you’ve done 20+ hours of travelling it’s knackering full stop. Good nutrition and hydration especially I found to have a big influence above sleep and travel. Recovery is often compromised also, but it depends how much time you have until you compete next as to how much of an influence this can have – if you have a week, it just means your recovery will be delayed and take longer to restore full state of readiness. If however you are in a tournament with multiple games in a short space of time, recovery becomes very important. A recent experience away with the GB Lions American football team at the Group B European championships in Milan showed how important recovery was. Acting as team S&C coach also, I used my experience to put a schedule together with the coaches and physiotherapists for what training would be done and when etc and they worked tirelessly to prepare us for games and give us the best possible chances for recovery, storing up ice to allow us to have ice baths, taking care of supplements for post game and giving us time to sleep as we played late night kick offs, meaning we finished around midnight and returned to the hotel and by the time we had eaten, stretched and ice bathed it was nearly 2am before we got to sleep, often with bumps and bruises that needed extra attention. I had been at a previous tournament with the GB Lions (before I had studied recovery strategies and was not yet an S&C coach) and we had not been instructed on how best to recover, but were more left to our own devises, albeit with good facilities such as a swimming pool to cool down in and stretch. We played in hot conditions and had trained pretty hard in the 4 days before playing our first match, whereas in Milan we did a single 60 minute body weight circuit session on the first day we arrived just to stimulate some blood flow and get a little bit of match tempo readiness in the players. We then had around 40 hours before we played and only did some core and stretching for the next 2 mornings. From my perspective, I felt better playing in Milan than I had previously, part of this was down to my state of readiness. One point that is often over looked for athletes who have to travel and stay abroad for long periods of time is the boredom that comes with waiting to perform. Often you can’t and don’t want to go anywhere to save energy, it becomes important to do things with fellow players that relieve the boredom, in am team environment this is often easy as you are with like-minded people more often than not that you already know. Games, pranks, banter are really important, talking to people outside of the team and about anything other than your sport is often also very useful. Again if there is an S&C coach with the player(s) they may decide that the best thing to do for recovery is get away from the sport, do some shopping, sightseeing, water park or zoo etc. Players will likely also be out of their normal routine, so knowing this and integrating some of it back into their day can also be really beneficial, this may just be a morning run on the beach, playing video games etc. Whilst in Milan we had a day off after our semi final, where we were given freedom to do as we pleased for a few hours before team meetings in the evening, players visited the city, shopped and some of us went to a nice health club to throw a few weights around (nothing more than beach weights to boost the ego), relax in the many spa rooms and pools and eat out away from the hotel, it helped motivate us for our final game after losing our semi-final. I feel it is also important as an S&C coach when away with players to have some time removed from coaching to release some stress and keep you motivated for the long days working with sometimes difficult players and or situations. The S&C coach has to be an archer with many strings to his bow and be able to travel with flexibility. If you liked this article please share it, like us on Facebook, or leave a comment!! Remember, the next APA Workshop is on May 24th ‘Speed, Agility & Quickness Training for Sports,’ click HERE to book. Finally don’t forget APA are running without question the best value S&C qualification in the UK right now!! For more details click HERE! Over the last couple of days I’ve found some really cool online resources that I have found really useful and thought provoking. Most of my reading has been directed to the topic of Periodisation so I thought it would be interesting to share this in a Blog! In Part 1 I am going to discuss the organisation of the training into phases and talk about how those ‘phases’ should be distributed according to stage of development. In preparing this blog I have collated articles from coaches with more than 40 years experience in Tennis and who are at the forefront of the sport science research into the periodisation of training programmes. For more information please check out Issue 36 of the International Tennis Federation (ITF) Coaching & Sport Science Review (CSSR). I’d also highly recommend taking a look at Tennis iCoach which is the coach education subscription website of the ITF. I also came across a gem of a website (CVASPS) Central Virginia Sport Performance which is run by Jay DeMayo who has been the Head Strength and Conditioning Coach for Men’s and Women’s Basketball at the University of Richmond since October 2005. He is making a lot of the Eastern block research more accessible and it rekindled my fire for further reading into the practises of the Soviet and Eastern European sport scientists and coaches of the 1960s-1980s. In particular I have been studying the work of Natalia and Yuri Verkhoshansky and reading about their latest book “Special Strength Training: Manual for Coaches.” We will be looking at the concept of Special Strength Training as it relates to periodisation in more detail in Part 2.
generate a great amount of discussion between coaches around the world and I would be happy to receive your feedback on any of the points raised. Simply put, periodisation can be considered a process of structuring training into phases to maximise athletes’ chances of achieving peak performance, and therefore their competitive goals (Bompa, 1999). APA provides Strength & Conditioning services to a complete spectrum of athletes from 5 year old children all the way up to professional athletes. For this reason, I like to think of the process of achievement of ‘peak performance’ as a journey. In order to truly peak the athlete will need to have first fully optimised their overall physical potential and then spent enough time fine tuning their sports skills to realise this potential in the competitive arena. This process is thought to take in the region of 10 years and 10,000 hours so our training plans need to reflect the stage of development of our athletes. 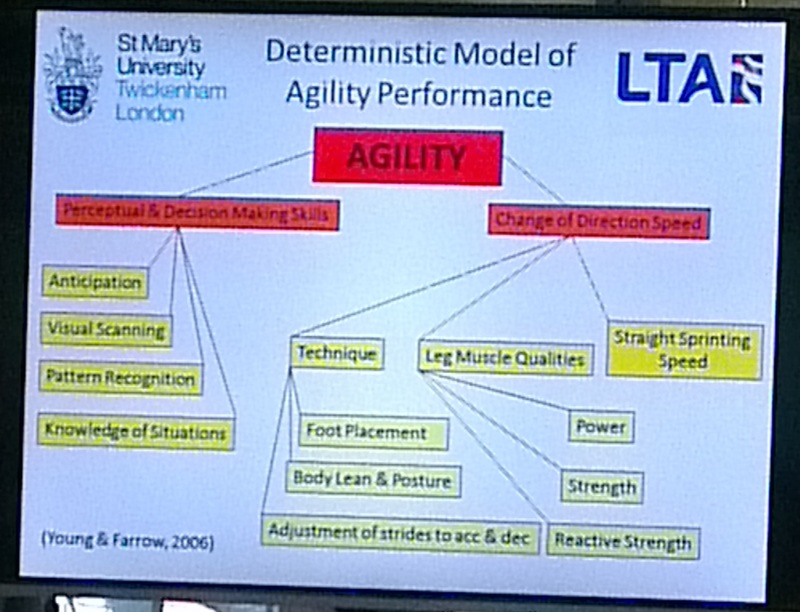 Therefore at APA we subscribe to a Long Term Athlete Development Model (LTAD) and break the training down into stages. Puberty (see below) is a key period in a young athlete’s life as it represents the point in time when we can begin to train the athlete with more advanced forms of training. This usually occurs around 12 years old for girls and 14 years old for boys although it can typically occur up to two years earlier or later. In my experience it tends to be earlier for girls and later for boys. As it relates to periodisation we have different approaches to periodisation for each of these Levels. The Table below shows how at APA we gradually put more emphasis on achievement of a ‘peak’ performance. A double periodisation phase means that in the Annual cycle there will be two cycles of preparation and two cycles of competition. Below are a few key points made by Piotr Unierzyski (University School of Physical Education, Poznan, Poland). These points were in the context of guidelines for young Tennis players aged 12-14 years but I think they are pretty applicable to any young athete’s periodisation. Two peaks can be scheduled for 14 year old players (for extremely well-prepared and talented players the plan can be divided into 3 cycles with three peaks), but it remains important to have relatively long training/preparatory periods.  The younger/less experienced players are, the more time they need to learn/improve particular skills. It therefore follows that these players should practice proportionately more and partake in longer preparatory periods than advanced juniors and professionals. The quantity and QUALITY of training is important (van Aken, 1999).  From 15-16 (girls) and 17-18 (boys) years of age, planning and periodisation takes on a philosophy and structure similar to that adopted with professional players. Improvement is still important, but programs should be tailored to elicit peak performance at the most important event(s) and less important tournaments used to optimise preparation.  The structure of all cycles should take into account the school calendar (i.e. holidays). Below is a Table which gives some considerations to the amount of training and competition that would be appropriate for a young athlete (female) moving out of Level 4 and into Level 5 of our APA Training System. This would probably equate to a girl of 13/14 yrs moving out of 14-unders (double periodisation) and into 16-unders at aged 15 (triple). For boys the equivalent could be moving out of 16-under and into 18-under. As you will know now APA spends a lot of its time working with the sport of Tennis, which brings a number of specific challenges. Periodisation is perfectly suited to sports like Weightlifting, Swimming and Track & Field which have long preparation periods and only a few major competitions to prepare for each year. block of 4 weeks (Raabe & Verbeek, 2004). Now there are some ways around this and I am going to now talk about the Periodisation Model that we use at APA, known as the ‘Concurrent Training Model’. When training time is pressed this is the most efficient way to organise training so that athletes don’t have to wait for weeks and weeks before they can train at the intensity that will prepare them for their sports. This is especially important in a sport like Tennis where we only have the athletes for 2-4 weeks at a time!!! I don’t want to get into the specifics of the different types of models (Linear, Wave, Block, Undulating, Conjugated etc). For me I use the term ‘concurrent’ to be a catch all term to describe the concept that we use which means we train all forms of biomotor ability all the time; it’s just the blend that changes. But before I get into the specifics of the APA Periodisation model I need to introduce some basic terms to describe the different types of ‘phases’ that are typically in use when planning training. Competition is often the most anxious time for players, and pre-competition phases are a must if players are to build their competitive confidence (a quality that reflects how individuals feel about their game and importantly the work they have done). These phases should commence at least two weeks prior to the start of a tour. Tournament blocks in Tennis typically last for no longer than five weeks, and the event prioritisation and peak performance is typically pitched toward week two or three of the tour. This means there is usually 1-2 weeks of less important competition planned before the first major tournament (known as pre-competition). Tennis load is at its highest and S&C load tends to be lower but of a very high intensity. Over the last few years my approach has changed in a number of ways. This relates to two aspects: The training model (Linear vs. Concurrent) and the particular focus of Pre-Competition training. I used to follow Matveyev’s early linear or traditional model (Matveyev, 1964) in my approach to the Preparation and Pre-Competition phases for all athletes. Summarised as the combination of low intensity/high volume training progressing to high intensity/low volume training so as to coincide with one or more competitive peaks during every macrocycle, the model has been widely used across sports. Generally, from a physical perspective, it moves from a hypertrophy phase (General Preparation), to a strength phase (Specific Preparation), to a power phase (pre-competition). Preparation: I now believe Training should become increasingly non linear as athletes mature. I still think that young athletes need to focus predominantly on ‘loading’ progressively from hypertrophy to strength to power. However, that doesn’t mean they will not be ‘practising’ or using lighter loads on different aspects of the Force-Velocity curve at each phase. For example, our young athletes practice Olympic weightlifting all year round. With my more advanced athletes there will be ‘loading’ of all parts of the Force-Velocity curve from the beginning of the preparation period. It will be the emphasis that I will shift BUT all forms of training are present from the outset. This means that advanced athletes will be loading up on hypertrophy, strength and power either in the same session or at least in the same week (microcycle). To differentiate between the level of athlete and the most appropriate forms of training I use the term ‘Basic’ and ‘Advanced.’ Taking the example of strength, I would classify hypertrophy as a basic method so that means our young athletes can overload this aspect. But I would classify Maximal strength training as an advanced method so our coaches know that this shouldn’t be a focus of overload unless the athlete is more advanced. In APA’s Training System I categorise someone who is in Level 4 as being ready to do more Advanced Loading. The main thing we have to try and do here is marry the tennis tournament schedule with the physical needs of the athlete. Often the athlete has a very advanced ‘Tennis age’ and is on a triple or multiple peak tennis plan but their physical develop needs would be better served with longer periods of less interrupted preparation!!!! 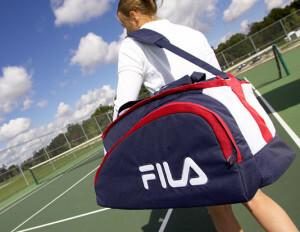 1- that Tennis has an extremely short period of time to prepare physically. This is typically 2-8 weeks. Therefore, I typically try to develop the qualities of Maximal Strength and Explosive power concurrently during the Preparation phase. If an athlete is weak then obviously they will spend more time on developing strength. If I waited until the pre-comp phase to develop power capabilities I would have about 1 or 2 weeks maximum to do this. 2- that Tennis is a power-endurance sport. Yes the energy demands for each sprint come predominantly from anaerobic-Alactic pathways but these bouts of high intensity exercise have to be sustained by aerobic oxidation in the recovery periods and they have to be repeated during something like 38-80 changes of direction per set and 300-500 bursts over an entire match!!!! My goal in the pre-competition phase is to prepare the body more specifically for the event demands. This means I will do up to 3 sessions aimed at increasing the conditioning level of the athlete, and specifically power endurance. Having developed a good base of aerobic/anaerobic fitness as well as speed, strength and power in the preparation phase it is now time to learn to endure those qualities. This is where we do this. This usually lasts 2 weeks and can occur ‘on the road’ in an ideal scenario as the athlete is competing but at lesser important tournaments. Here we can target a few sessions of conditioning at the beginning to middle of the tournament and do one more at the end of the tournament. Yes, it is important to avoid accumulation of fatigue at the end of this phase, so before MAJOR tournaments I will add in a Taper week which is often during the tournament before the most important one. Here I strip away the volume of conditioning work and actually focus back on the strength and power workouts we did in the late preparation phase -usually a few times in the week- but at a lower volume than in the preparation phase. Usually early in the week we will do a strength orientated session and later in the week it will be more explosive power orientated. We don’t want to do anything that will accumulate fatigue so all drills should be anaerobic-alactic devoid of neural fatigue, and we prioritise tennis tactical goals as well as regenerative and injury prevention means of training. Everything that we have discussed so far has prepared us for this peak; the time when the athlete should be psychologically, physically and technically/tactically at their optimal level of readiness to perform at their highest level. I hope you have found this information useful and I very much look forward to hearing your comments about the APA Training System and its approach to Periodisation.